Downrange Density is the culmination of Scott Sonnon's work with some of our countries bravest of warriors. As a TACFIT program, it carries the hallmarks of a TACFIT system: mobility for structure integration, regressions of exercises to correct imbalances & progressions to further develop ones strength / skill, and compensations then to address any negative tension accumulated from the workout and that current day as a whole. Coach Sonnon has formulated a program structure based on YOUR NEEDS; and with Coach's help - it is from this point that you discover your 'point A'. Downrange Density gives you multiple Checkpoints of reference to have tangible proof of your progress as you work toward your 'point B'. Downrange Density implements mobilization, movement sophistication in locomotion, as well as strength & endurance training. On top of all this Coach Sonnon teaches you how to apply these strength-skills to your life for general fitness, your hobby or sport, or your professional occupation/vocational needs. Coach Sonnon provides technical variations of all these movements ranging from novice to the most experienced and for people of all ages and fitness levels. 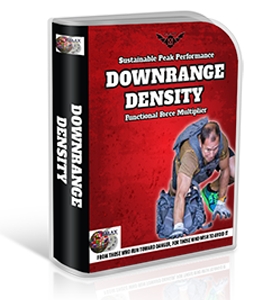 Based on the principle of maximal technical application over maximal effort output; Downrange Density will upgrade your training practice to the next level.